I took this image back in June after an evening out at Konza Prairie. 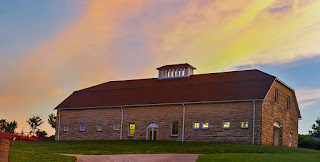 This is the stone barn at sunset that has been restored and converted into meeting areas. Some of the barn features and woodwork and stone was kept in the interior restoration and it is quite beautiful inside as well as out.